Can we be honest? We need you! 826michigan’s robust roster of innovative programs offered at no cost to students and schools is made possible by thousands of annual contributions, large and small, of time, funds, and other resources. 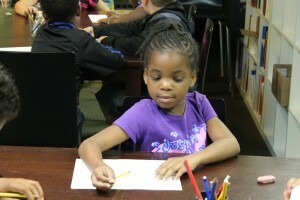 When you make a contribution to 826michigan, you’re directly improving the lives of local school-aged students. Our programs help students succeed in school and in life. Donors make that possible. 826michigan volunteers provide one-on-one homework help, teach creative writing, and work the counter in Liberty Street Robot Supply & Repair, among many other essential tasks. Help shape the future: volunteer with 826michigan!